iChinese helps you to learn Chinese! As a native application for the iPhone and the iPod Touch, iChinese is the ideal companion to let you at any time and any place look up Chinese characters in the dictionary or to find out the correct pronounciation of a word. You want more than flashcards? 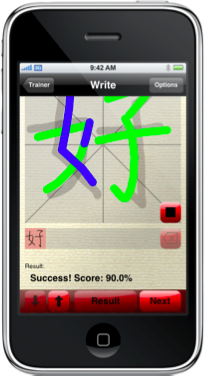 With the intelligent Trainer you can train vocabulary from wellknown Chinese training courses. iChinese makes use of diversified exercise types, like writing, reading and listening exercises. Available in the Apple AppStore are the main iChinese application as well as lesson packs and extension modules (e.g. chinese speech output). A list of all currently available lesson packs and extension modules can be found here. Read more about the features here. AppStore icon to the right!